Almost exactly one month ago, on Monday, July 22, I vowed to spend at least a couple of minutes a day for two weeks attempting to learn to play the ukulele. Here is how the story began and how it has unfolded in the past month. Immediately after this, I thought to myself, it would be fun to be playing ukulele and singing like Jim just did. I was totally blown away by this performance, and was convinced of the limitless possibilities of the ukulele. I instantly decided that I wanted to learn to play the instrument. I had never played a string instrument before: once I had tried guitar for a couple of minutes and given up forever because it had seemed way too hard. What happened to the “year of music”, 2005? In August 2002, I bought a flute hoping to get back to playing the instrument, after not having done so in two decades, but I quickly gave up because it seemed too hard. This despite buying exactly one piece of sheet music with the plan to play it, “Après un rêve”, which by the way I finally ended up playing a decade later, at a party last month. In late 2004, I decided that in 2005, I would give one more shot at playing music. “Unfortunately”, on December 29, 2004, I went to a meeting of the Pittsburgh Chess Club for the first time, got hooked, and shortly after that, joined the club, and began playing in tournaments again for the first time in two decades. I spent a number of years making chess my main activity outside of work, until I met Abby in late 2006. Back to February 5, 2011: this very day, I immediately told Abby that I wanted to play ukulele. She was skeptical, but had her friend Lynette lend me a soprano ukulele to try out. I immediately started to practice recorder regularly (because it seemed an “easy” gateway to playing any music at all without a steep learning curve: I was discouraged by my failure at flute years earlier), and also planned to start playing ukulele. On March 2, 2011, I finally ordered a soprano ukulele online, because the one lent to me simply had structural defects. But I had the same frustrations as with the loaner ukulele. The instrument seemed very hard to play. On March 20, 2011, I went to my first meeting of the Pittsburgh Recorder Society. I was making progress with daily practice, and so I completely abandoned the ukulele. It collected dust for well over two years. It turned out that I did continue with recorder, largely because I found the Pittsburgh Recorder Society and joined it, and I have been playing recorder ever since, even attending my first music camp less than two years later, the week-long summer 2012 Mideast Early Music Workshop, which focuses on recorders. If there had been a Pittsburgh ukelele group at the time, the course of my entire musical life could have been altered: I would not have spent the last two years of my musical life on recorders, modern flute, Baroque flute, Irish flute, and tin whistle (years that I treasure, so I am actually glad that I gave up ukulele when I did!). Fast-forward a year, to the first Steel City Ruby conference, where I knew Jim Weirich was going to be a speaker, and therefore that he was going to do a music jam. I brought my Irish flute, not really sure whether I was going to have the courage to join in, since I had only just begun music jamming. I ended up completely chickening out and choosing to go out for lunch instead, and when I came back they were still playing and I watched. I silently vowed to myself that the following year, if Jim was coming to Steel City Ruby again, I would not chicken out. I launched myself into the new local French music jam, going to my second one just shortly after Steel City Ruby, and then proceeding further, bit by bit overcoming my fear of being incompetent as a musician. The entire past year has been very rewarding for me musically, as I kept on practicing, playing, anywhere and everywhere, on recorders, flute, Baroque flute, Irish flute and tin whistle, melodica, voice. Some of my newer musical activities this year: tango on flute, blues. I thought to myself, heck, I’ll give this a shot. It would be a no-risk attempt to try again to learn the basics of playing a string instrument! So I signed up. I was lent a treble viol. It was crazy hard for me to learn how to bow without making horrible sounds, and hard for me to play the most trivial melodies by fretting while bowing. Neither I nor the other beginner after just a week felt ready to even play a simple melody in the final student concert. I had spent quite a bit of time practicing. If I really wanted to, I could play a bowed string instrument; my strokes and control were clearly getting better every day. If I really wanted to, I could play a fretted string instrument; I was slowly becoming able to pluck out a melody. If I really wanted to, I could learn to be competent at viola da gamba, just like all my other workshop companions who told me they had started as total beginners years ago. It turns out that I’m not very interested in playing viola da gamba, compared to lots of other things I could be doing. But the confidence that I could if I wanted to was very empowering. It turns out that in June, before my music camp, Farokh had started learning to play guitar. On July 22, two days after I returned from music camp, he told me he getting very serious about guitar. This was quite impressive because unlike me, he did not even have any musical background at all in K-12. I was deeply moved by Farokh’s dedication and seriousness as an adult latecomer to music. 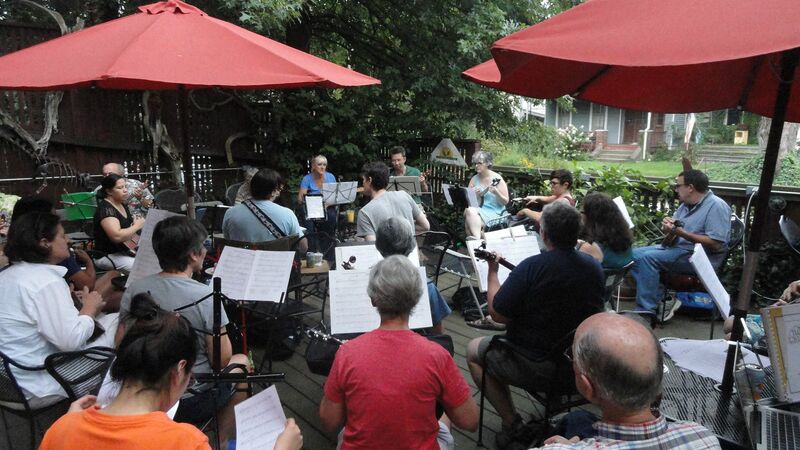 Yes, there is a Steel City Ukuleles meetup group. I have known about it for over a year, by accident from an article in the Pittsburgh Post-Gazette. So on March 28, I had written the organizer, “Hi, I just saw a local news article about the Steel City Ukuleles. I bought a soprano ukulele a year ago but have barely started learning to play it. I’m interested in getting going on it and maybe joining the group.” I got a friendly response, but given that I could not really play, and that I was already very busy with my recorder and flute activities, I had no time to try again to learn ukulele from scratch. There was no way I would attend the meetup until I was at least a beginner. On July 22, I started “practicing” ukulele no more than five minutes a day (that’s as much as I could tolerate without calluses on my left fingers), and just trying to make the most basic chords after C work (which they never had earlier): G7, F. I kept on smudging and buzzing. 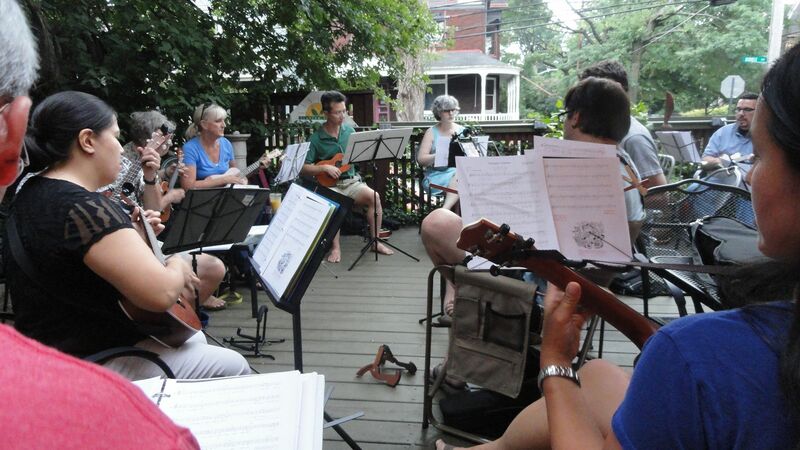 On July 28, six days after starting again with ukulele, and making tiny bits of progress, I wrote Farokh, “My plan with uke is to take just a few minutes a day for the next week or two, then reassess what next. I have to observe the advice I give everyone: something small every day for two weeks before giving anything up.” In my experience, when learning something new, the first two weeks can be very, very discouraging, but if you quit before the two weeks are up, you may never know how close you were to making the breakthrough that everyone else who persevered can make. On July 31, I was continuing to make progress, playing longer than five minutes at a time. Calluses started forming. Fingers became more precise. Still could barely actually play, but the improvement was real. I decided to aim to get proficient enough to attend the September 4 meeting of the Steel City Ukuleles. I did not feel I would be ready to attend the August 7 meeting. But at least I used the trick of committing to the September meeting, by posting to the August event site introducing myself and saying I planned to come in September. I wanted people to know that I was just starting out and had a month to get ready. I also wanted people to remember that when I showed up, so that I wouldn’t be just some random guy, but the guy who told us a month ago he was going to come. I started working through some books on ukulele. Progress through them was very difficult, because some of the books just went way too fast, without explanation. These concise books are worthless. On August 3, I got hold of “The Complete Idiot’s Guide to Playing Ukulele”. This was useful, but had confusing orders of presentation and omissions in explanation. Still, I managed to learn some more chords (while still not playing anything quite right) and some fingerpicking while at it. I hit a wall pretty quickly though. The book has a lot of really hard stuff in it, and could occupy me for a year or two, I think. On August 10, I started working through “Ukulele for Dummies”, and made good progress. After my three-week trial period of daily practice, I assessed my status. Despite the ups and downs of practice, I knew that I had made tremendous progress. Sometimes I would plateau for two days but then suddenly “get” something. I still had trouble with the most basic barre chord, but actually, when I counted, I had learned around twelve chords and could do some basic progressions in some keys. I was buzzing out less and my fingers were starting to go just where they needed to go (if the chord changes were slow enough). It was an amazing feeling, the feeling of being a beginner rather than being nothing at all (which was the feeling I had during the whole first week and part of the second week). But I was getting increasingly annoyed by the fact that my instrument seems defective. The A string is sharp when fretted. I still don’t know what the problem is. 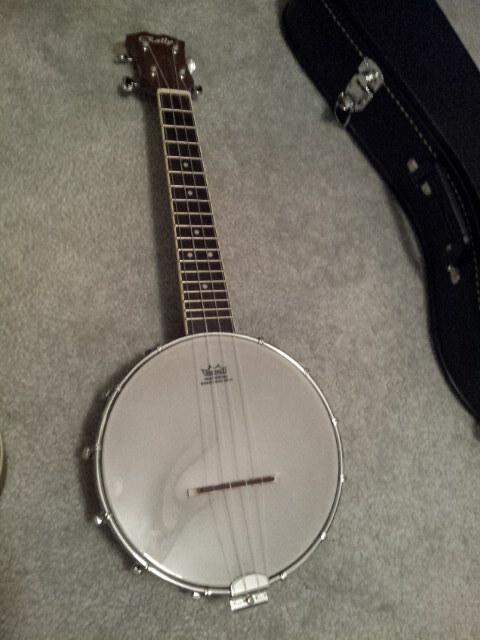 I regret having bought this instrument years ago online, unseen and unplayed. The first morning of the Steel City Ruby conference, as I was about to leave home, I suddenly had a thought. Originally I was going to bring my Irish flute to the conference, as I had last year, to join a music jam with Jim Weirich (a speaker again at the conference). So I did bring my ukulele. Early on in the day, it was announced that there would be a music jam on the second day of the conference. So the next day, I brought my ukulele in again. And so we had a music jam: Jim, PJ Hagerty, Carol Nichols, and me. So I ended up playing ukulele with others sooner than I had originally intended or expected. Also, at one point I briefly swapped instruments with Jim so that I could feel what it was like to play a tenor. Surprisingly to me, although it was of course “big”, it was not as unmanageable as I feared it might be. I always imagined that eventually I’d “graduate” to playing a tenor, after first playing soprano, then concert size, sort of like my progression on recorder of first soprano, then alto, then tenor, then finally bass. 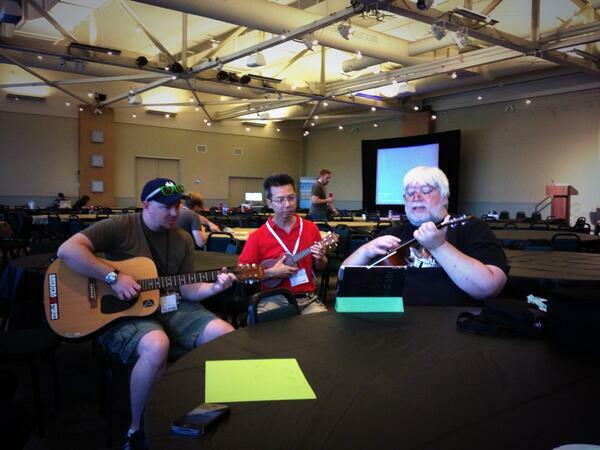 The very day after the conference jam session, I got email about the Steel City Ukuleles meeting on Wednesday. In my “planning”, I had neglected to realize that the group met twice a month, not just once a month! So I didn’t have to wait till September 4 after all. I felt I was probably already competent enough to function on Wednesday; I looked at the musical selections, and felt reassured that even if I still have problems with fast chord changes, I could participate without making a total mess of everything. So I signed up! I went to the local music store to check out concert size ukuleles, because if I need to get a better instrument, I think I might like that size better than the soprano. I have not made any decisions yet. I feel I need to improve further, to better understand instruments and try different kinds, before buying another one. When I arrived, Linda lent me an electric tenor for me to try out. I ended up playing it for the whole two hours because the intonation was good, unlike my soprano. For the most part, I did not have difficulty with the larger instrument. How fitting it is that the very tune I first heard from Jim Weirich almost three years ago is the one to close out my first attendance of the Steel City Ukuleles! A month ago, when I was only practicing ukulele five minutes a day, I was still doing some flute practice. But I have not been playing flute or recorder for quite some time now (last time was probably a week ago). I feel bad about this, but I seem to be in ukulele mode now. I need to keep flute and recorder in “maintenance mode” rather than just abandon them entirely. Meanwhile, it is of course very exciting to be a beginner at ukulele. To make massive improvements on ukulele, I must make it my musical focus. Linda warned me that her electric tenor ukulele has a high action. 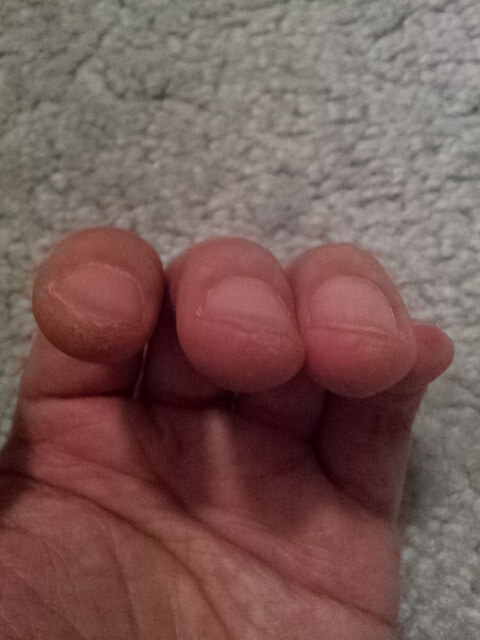 After playing it the next day at home, I realized that indeed it has a high action that shreds my left fingers. So it’s not working for me. I’ve been using it to get the feel of the concert size while continuing to practice and learn, and so far it’s been working great, giving me confidence that I should in fact buy a concert size ukulele. A month later, I actually did finally buy a concert ukulele! It’s been quite a journey, getting into music and into ukulele through seemingly chance and trivial events such as music at a Pittsburgh Ruby meetup and hearing about Jake Shimabukuro. And I’m so excited that I’m playing ukulele now. It’s a whole different music world for me. I’ll write more about what I mean, as I continue to progress. Two weeks after my first Steel City Ukuleles meeting, I went back for more, attending my second meeting.